Happy hump day friends! I am SO excited to bring today's post to you guys. I can't believe that Christmas is this weekend, but I've been doing everything I can to get in the Christmas spirit. I've been winter outfit planning, scheduling festive activities with family, burning all of my wintry candles, and baking up a storm! However, my favorite thing to do to embrace the Christmas spirit is find a way to give back. I am so blessed to have all I have. I have a good job, a loving and supportive family, and a boyfriend who makes it feel like Christmas everyday. I am so lucky to always have food in my fridge and a bed to come home to, BUT, not everyone is that lucky. This time of year is so fun and exciting, but in the midst of that, it is so important to remember those less fortunate. Today, I thought I'd share 5 quick ways to make a huge difference in people's lives and spread some love this time of year. Happy FRI-YAY friends! I am triple-y excited because 1. It's Friday, 2. the last of my gift guides is going up today, just in time to order your last minute gifts for next week, and 3. I graduate from college today!! It's going to be a whirlwind of a day, but I'm happy to start it with you, here, sharing my gift guide for the girls. 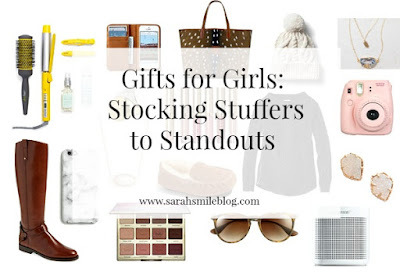 I've included everything from smaller items which would be great for secret Santa or stocking stuffers to some pretty big ones that would be amazing to find under the tree! 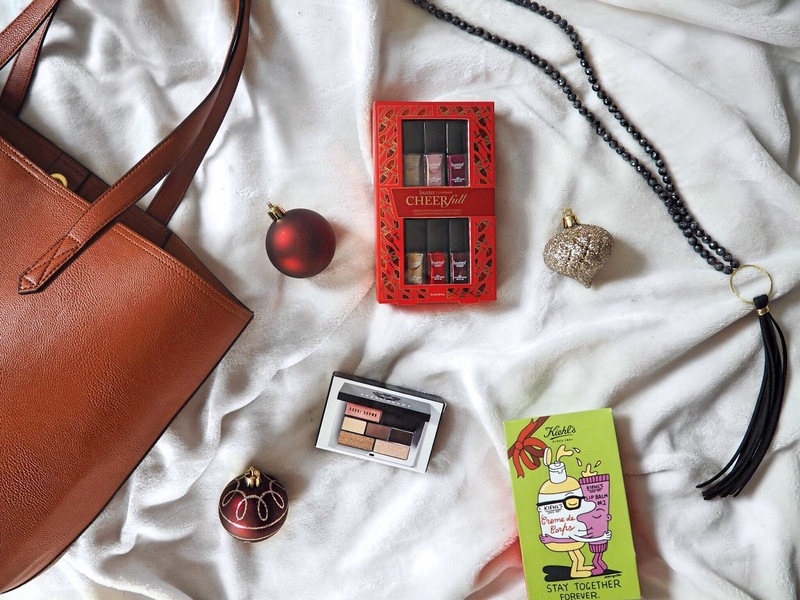 I think the Tarte palette, which I've been eyeing for forever, the Kendra Scott earrings or necklace, this adorable marble phone case, a cute Polaroid camera, a beauty gift set, a cute bobble hat, or this cell phone wallet would be great for a smaller gift that still packs a huge punch. I think those are great for family gifts or gift exchanges because you don't need to know a size and you know they will be loved all around! 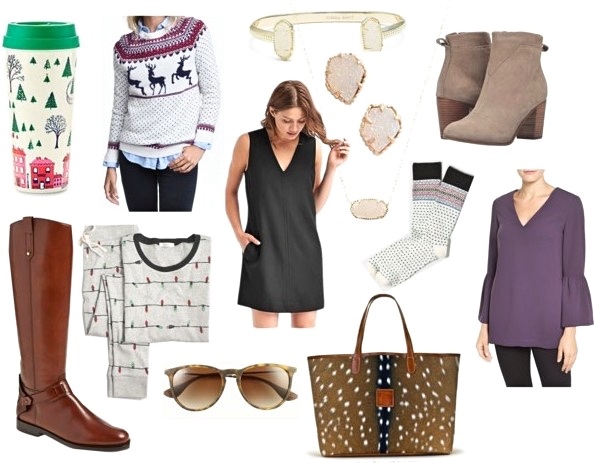 My personal favorites are the Tory Burch boots, which were the best Christmas present I've ever gotten simply because they are a permanent staple for years to come, this Drybar set, this signet ring, this fisherman sweater, and this deer print tote. I think those are definitely on the more expensive end, but they're things that will be in use constantly and such good quality. I have the boots and the ring and I love that I can pretty much wear them everyday, when the boots are in season. The Bose bluetooth speaker, the Rayban sunglasses, and the UGG slippers are also classics that are guaranteed to be the best gift under the tree. A good bluetooth speaker is something you can't go wrong with as almost everyone has an iPhone these days. A luxury pair of super sleek sunglasses? Who doesn't like that? And those UGG slippers are perfect for people like me who have cold feet year around. I already feel cozy just looking at the super soft lining. Last, but not least, is this Starfish Project necklace. I recently found this company and while I love their jewelry, their mission of taking girls and women off the streets, giving them a home and teaching them a skill they can find a god job with, is incredible. I love giving gifts at Christmas time that continue to have an impact year around, and this is one of them. It adds an extra special layer because not only do you get a super cute piece of jewelry, but you're also helping save someone's life. You can't beat that! Good morning everyone! Can you believe Christmas is NEXT WEEK? What is even happening. I still have mess from Thanksgiving around my house...embarrassing. This week is Gift Guide Week on Sarah Smile Blog, and I think I came up with a few good'uns on Monday for parents all UNDER $100. I definitely think parents are the hardest to shop for, but a close second is 100% boys. Whether it's boyfriends, brothers, close friends, you name it, it's really hard to find a good gift when they're not super specific about what they want. 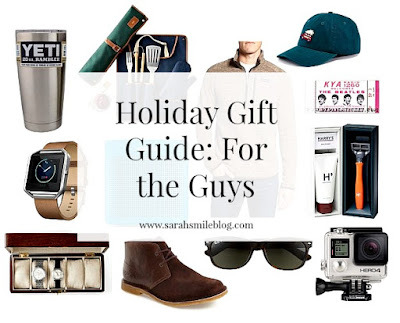 I've rounded up some things I think any guy in your life would love, and with the exception of a few things, they're all under $100 too! Yeti Cup / BBQ Set / Patagonia / Vineyard Vines Hat Fitbit Watch / Bose Bluetooth Speaker / Tickets / Harry's Shave Set Watch Holder / Chukka Boots / Ray Ban Sunglasses / Go Pro Camera Similar to my Dads' gift guide, I generally think going with more outdoorsy, rough and tumble type gifts is always a good bet. For the most part, guys like to be spending time outside, so buying things they can use for the grill, on a boat, or when they're out getting their fitness on are all gems in my opinion! That Go Pro Hero camera is a good one for any upcoming adventures the guy in your life may be taking in 2017. Those Ray ban sunglasses, that Yeti cup, and the Bose bluetooth speaker would go great with an early morning hunt or fishing trip, and that Vineyard Vines hat would work for any activity any day of the week..I'm even jealous of it. The Fitbit Blaze watch is SO cool and I think anyone who is health conscious or into personal fitness would love it and that Patagonia pullover is great for running at the gym or running to that early morning class. I also love this watch holder for a guy that travels often or just likes everything to have a place, and these Chukka boots are such a nice shoe for guys in the colder months. Any sort of gift set is a nice gift because it's a good intro to a brand without being lots of full size products. This Harry's one is really cool because you can even monogram the razor, plus it comes with shave cream and extra blades! One of my personal favorites is this monogrammed grill set from Mark and Graham. It's nice to keep everything in one place, but it also looks very official, which I know all the men in my life like when it comes to their grill. Last but not least, I love personalized, special to you gifts. I think tickets for an upcoming baseball game or concert for a band you both like steals the show because it's making memories and you can't beat that! Good morning y'all! I am so excited for this coming weekend because I am off to San Antonio early tomorrow morning. If you don't know, I am a huge Billy Joel fan, and I finally get to see him live tomorrow night. So, if you don't yet, follow me on Instagram to keep up with all the festive weekend activities! 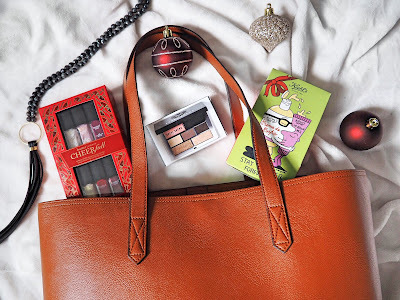 Today's post though, is all about holiday parties and what to wear for them! This season is full of cocktail parties, work Christmas shindigs, and family dinners. I always spend so much time in front of my closet trying things on and wondering what to wear. I normally wear lots of black, white, and navy during the winter, but lately I've been loving all things RED. Today, I have a skirt, dress, and lipstick to share with you, and I hope you love them as much as I do! 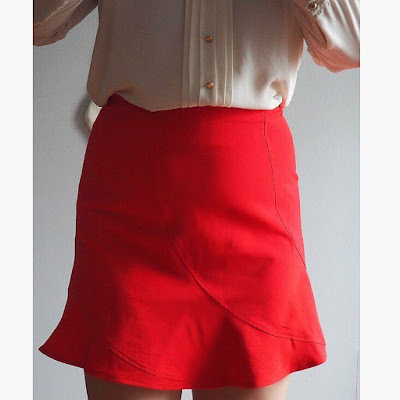 I got this skirt from The Styled Collection a few months ago and fell in love with it the minute I saw it. It flares out a little at the bottom, in an upside down tulip shape, and I think it's so flattering. I originally ordered in a medium because the fabric is super stretchy, but I ended up returning for a large because I find it runs a bit small. 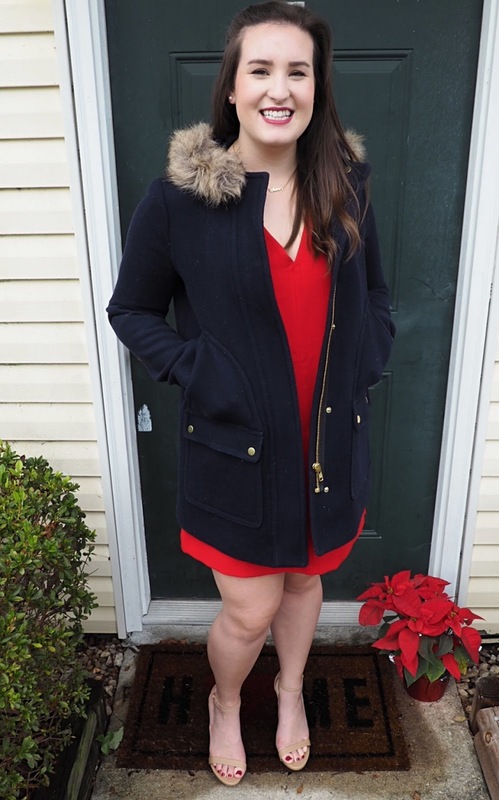 I just paired it with an old silky blouse and it made a perfect simple, yet gorgeous colorful holiday outfit! You could dress it down with flats or add some sleek heels to step it up a notch. It is now sold out (UGH), but I've linked a few similar blouses and skirts so you can recreate it if you'd like! 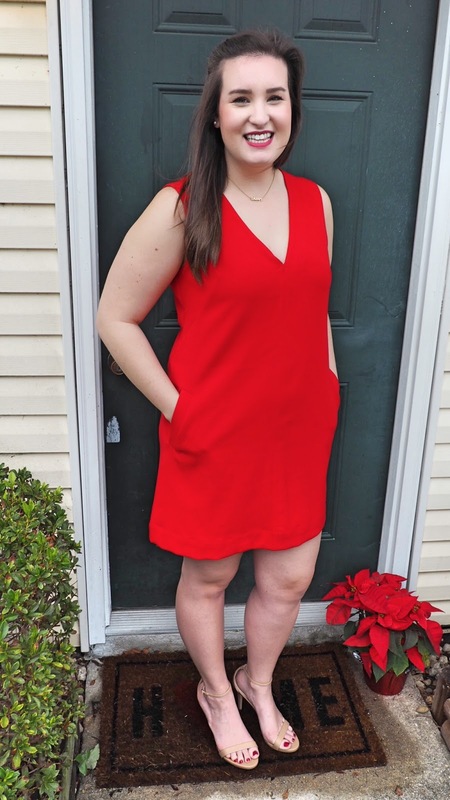 My favorite piece for the holiday parties is this red dress from Gap. It is very well made, super soft and stretchy, and is so flattering. I really like that the length is a little longer than your average mini dress because I don't have to worry so much when I bend over or reach for something. I paired it with the Steve Madden Stecy heels, but I think it would go well with flats or even booties! The Stecy heels are 100% out of my comfort zone, but I actually really like them. I'm horrible at painting my toes, so that makes them a little tricky, but I love how they make your legs look longer. I can always use a bit of that! I am wearing Nars Damned in these pictures and I love it. It's a more cranberry-ish, purple red, so it's a bit different than your usual holiday red. It will go well with all of my neutral colors, but I think it paired really well with the bright red of my dress too! My coat is last year's version of J.Crew's vail parka. LOVE. P.S. Don't forget to enter my Holiday Giveaway! 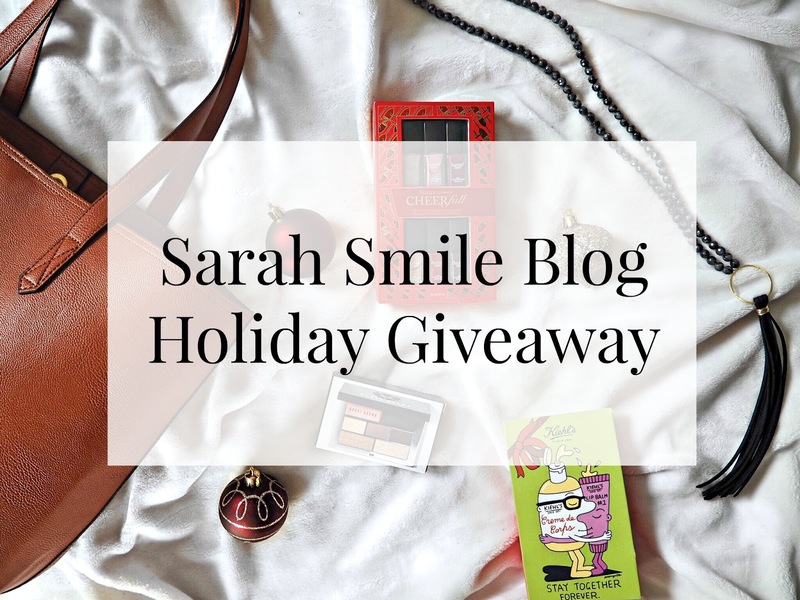 You could win over $150 worth of holiday goodness, so don't miss out!